The first significant cold front of the fall season has finally arrived, boosting our banding totals and bringing in large numbers of Swainson’s and Grey-Cheeked Thrushes. On our busiest day, September 7th, we banded 87 birds, including 47 Swainson’s and 15 Grey-Cheeked Thrushes. As the season progresses, Grey-Cheeked Thrushes will come to predominate and then be replaced by the later-migrating Hermit Thrushes, but for now the Swainson’s Thrush is the most common species encountered in the banding area. Various warbler species including the Black-and White Warbler, American Redstart, Ovenbird and Black-Throated Blue Warbler have been seen in the netting area and on census, but not in large numbers. Higher numbers of migrating raptors have begun to show up as well, following the thrushes. While most raptors prefer remaining over dry land where the thermals they use while soaring are more common, Lake Erie’s mini-archipelago allows them to island-hop rather than making a detour around the Great Lakes. The census on September 10th was remarkably slow considering the favourable conditions of the night before – the low temperatures and north winds should have encouraged migration – and it seems probable that the large number of Cooper’s and Sharp-Shinned Hawks hanging around Fish Point caused the songbirds to stay silent and keep out of sight, thus evading observation both by predators and by PIBO staff. American Kestrels have been a common sight along the roads, perching on the telephone wires as they keep a sharp eye out for the small mammals and insects that make up most of their diet. 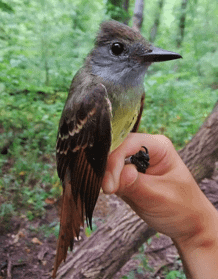 Two unlikely flycatcher species were banded at the beginning of this month: a Great-Crested Flycatcher on September 2nd, and an Olive-Sided Flycatcher on the 4th. Both of these birds are larger than the flycatcher species we usually encounter and seldom descend below the tree canopy, preferring high perches and open spaces. Great-Crested Flycatchers have been banded occasionally over the years, but the Olive-Sided Flycatcher was a first for PIBO. Another oddity was a leucistic American Goldfish, seen in the banding area on September 7th. Leucism is a genetic condition that prevents pigment from being deposited in a bird’s feathers, leading to a mottled or all-white appearance. It differs from albinism in that a leucistic bird may show some coloured plumage whereas albino birds are completely white; and in only affecting the feathers, leaving the bird’s eyes, feet and bill the normal colour. This particular goldfinch was completely white except for the black wings and cap typical of an adult male. And finally, the most unexpected observation of the past two weeks was the sighting of 16 additional American White Pelicans on September 9th, seen flying past the tip of Fish Point! This fall has been the first time that White Pelicans have been recorded on the island in PIBO’s thirteen-year history, and now two flocks have been spotted just in this season. Birders on the mainland in Ohio and Ontario reported a group of 15 White Pelicans at the Holiday Beach Conservation Area in Amherstberg on September 16th – perhaps the same group correcting course and heading back out west!